Here are my top 5 urban fashion that you will most likely see on the Streets of London today. Although Jordans have been around for a while now, they’ve become increasingly popular in male fashion. A shoe for the athletic, hip hop stars managed to style it out with a pair of baggy jeans and a simple plain tee, creating a trend that many have followed. #4 The half shaved hairstyle. This hairstyle suits some, but not everyone. Matching this hairstyle with some big stud earrings, bright red lipstick and smokey eyes will give you that fierce look. Soo, if you’re feeling indecisive and don’t know what to do with your hair, this is definitely the style for you. They’ve been more popular in the 2000s than in the 90s when it was first introduced. Hip hop artists like Chris Brown and Wiz Khalifa, and others have promoted them in their videos. 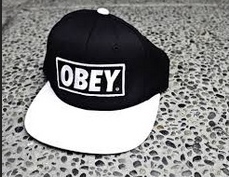 It’s seem that Obey clothing has been everyones favourite brand for snapbacks. Will you obey? They have been increasingly popular in female fashion, especially in the summer. Thanks to trendsetter Rihanna who has been styling it out with an oversize tee and ankle boots. Beyonce even got it on when she posed for GQ mag in cropped football jersey…you go Bey! Although the season of the sports jersey is over, you can still purchase a similar one from New Look for £14.99. Hurry, buy it before it all goes! And finally #1 is… da da da daaaaa. Leather. Faux or real. Leather seems to be everywhere, even on jumpers. Maybe Mr Kanye West has something to do with this. During his Watch the Throne tour with Jay Z, he performed in a leather skirt and leggings combo. 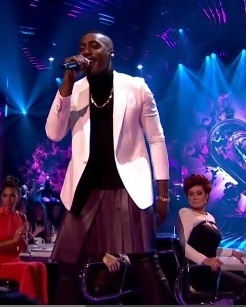 Yes, you heard me right, a leather skirt. As crazy as it looks (and sounds) he has influenced others into stealing his look. I guess we’ve all gone leather crazy. Fellas, if you’re hitting club and don’t know what to wear, go for this Cable Knit Jumper with a Leather Yoke for the smart look. And ladies, nothing goes wrong with a leather skater skirt and a cute crop top. So there you have it my top 5 styles you’ll definitely see on the streets. Is there something that should be on my list, that isn’t? Let me know.